One of the important aspects of the US economy is that recent business cycles have been longer. But also shallower. I believe that the internet is playing a big role in this “lower-for-longer” phenomenon. a) Pricing power reduction: Consider what is happening with retail store chain closings. They are casualties of the net: with a click of a button, mobile shoppers can find the lowest prices. And shippers can deliver the goods virtually overnight (if not sooner). Simply put, it’s damn near impossible to create scarcity. And scarcity is at the heart of inflation and economic expansion. But here’s the gotcha: this slow economy depends on low inflation. Even a small uptick in inflation can cause severe economic shock. This is why the Fed interest rate hikes are so concerning. When the economy is barely growing 2%, a 0.25% hike takes a big chunk out of the little growth that exists. Similarly, a small uptick in inflation has a larger impact than it might in the past. Throughout the first half of the year (H1 2017), companies were positive but restrained: they did not buy into Trump promises of extra growth. This meant that they invested accordingly and did not over hire nor over invest. However, households did buy into Trump’s promises. Consumer Sentiment surged post-election: from the lowest levels in 2 years to the highest in 2 years. By May, it became clear that Trump’s Administration could not deliver any stimulus in 2017. Consumer Sentiment has now stalled. A bigger reality check was the resumption of slowing income growth. 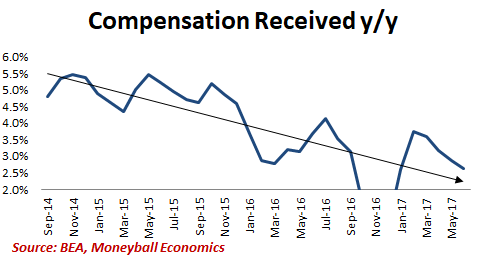 After rising in Q1, the Q2 pace of compensation growth has slowed each month, falling almost by half. 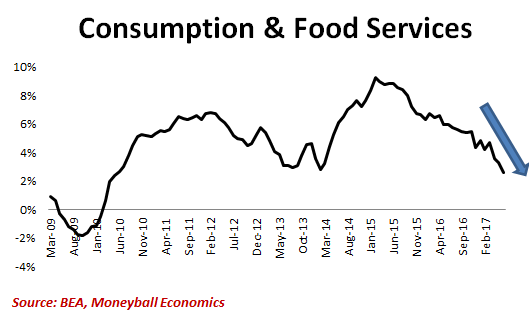 Accompanying that drop in incomes is a drop in retail spending, especially in Food Services. Read Is the US Economy Doing Just Fine? That pullback in nonessential spending is a red flag warning of some belt-tightening. Unlike other retail purchases (like gas and food), dining out or going to bars is very much a want and not a need. 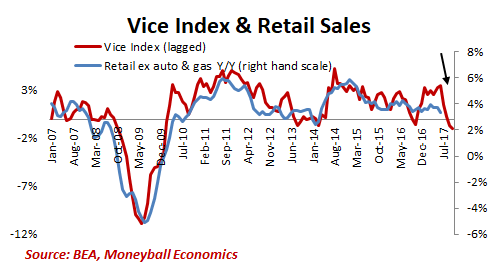 Coming up Next: Vice Index points to more belt tightening The Vice Index picked up on the Retail deceleration back in February (the VI has a 4 4-monthead) – and predicted a downshift in the pace of consumer spending beginning June. The latest Vice Index data says that Retail Spending for H2 2017 is poised to fall significantly, as low as 2% y/y versus the current 3.8%. And that assumes no change in the current low-inflation, low-interest rate environment. 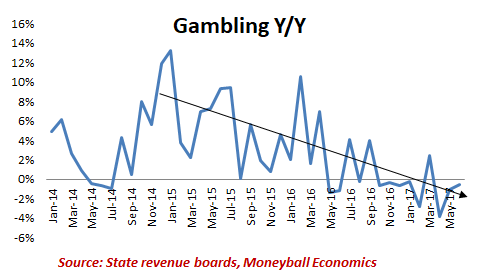 Nominal gambling revenues are flat in most major US gambling centers. Vegas, for example, saw June gaming revenues up only 1% y/y and up 3% y/y for H1 2017.
International Game Technology (IGT) reported a (-6%) drop in slot machine revenues (IGT dominates the Reno and Las Vegas slot machine market). To pump up their earnings, Las Vegas casinos have started to charge parking fees for self-parking. At $15 for 4+ hours, these fees will generate millions to casino bottom lines. KEY TAKEAWAY: The root cause is slightly fewer visitors. 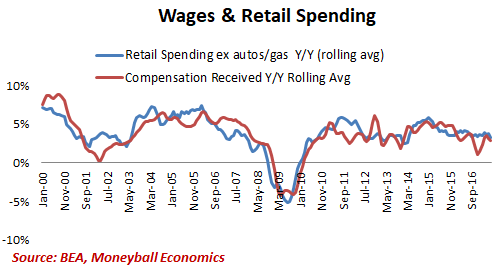 And it’s another sign of peak consumer spending. Gambling reflects household cash flow and consumer sentiment. 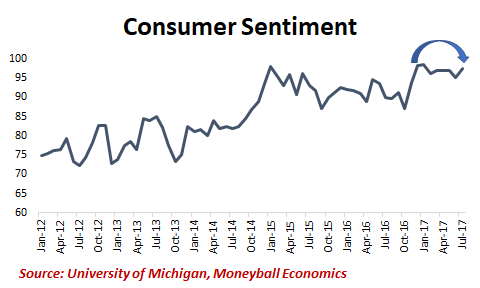 Consumer sentiment: The ability to lose money today implies that one feels positive about finances today and tomorrow. A trip to Las Vegas requires effort and advance planning. And significant funds for airfare, hotels, taxis, and dining. Conversely, local casinos cater to drive-up gambling: impulsive, spontaneous, and low effort. And much less costly in terms of time and money. Even better, local casinos tend to be in blue collar areas: Detroit, Atlantic City, New Orleans, and so on. Vegas, on the other hand, is an international destination that includes both tourists and convention attendees. Bottom line: Local casinos provide invaluable insight into Middle America’s near-term discretionary spending.